The YXZ1000R SS SE shifts the pure sport Side-by-Side class to another level with fully adjustable FOX 2.5 Podium X2 shocks, bead lock wheels, eye-catching color scheme and more. 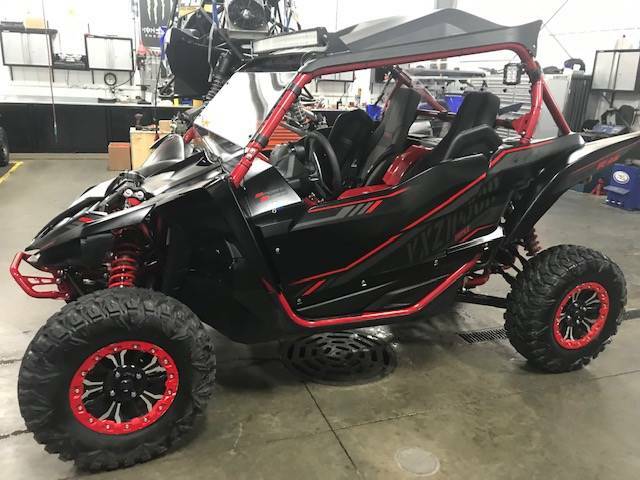 SPECIAL EDITION FEATURES: In addition to the industry-first, twin-wall Fox® 2.5 Podium® X2 Shocks and durable color-matched bead-lock wheels, the YXZ1000R SS SE is highlighted by a darkly aggressive Matte paint and graphics package with matching A-arms and ROPS frame for standout style. 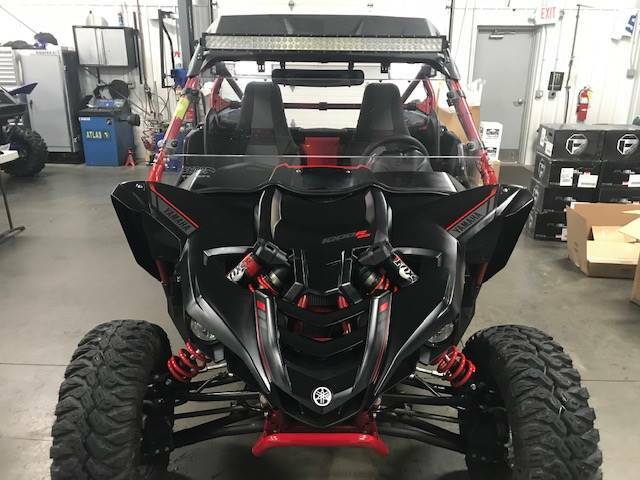 TERRAIN CONQUERING, INDUSTRY-EXCLUSIVE FOX® PODIUM X2 SHOCKS: No other suspension on the market can match the YXZ1000R SS SE's ability to deliver both low-speed comfort over the harshest chop while at the same time providing incredible bottoming resistance. Huge piggyback twin-wall FOX® 2.5 Podium X2 Shocks bring a whole new level of adjustability by not only giving you high- and low-speed compression damping adjustments, but, for the first time ever, high- and low-speed rebound as well, all mounted to the top of the shock body for easy tuning. All shocks also feature dual springs with crossover adjustment— providing 16.2 inches front and 17.0 inches rear travel. PURE SPORTS CHASSIS: Optimized frame dimensions make the YXZ1000R SS SE the best handling sport side-by-side on the planet. 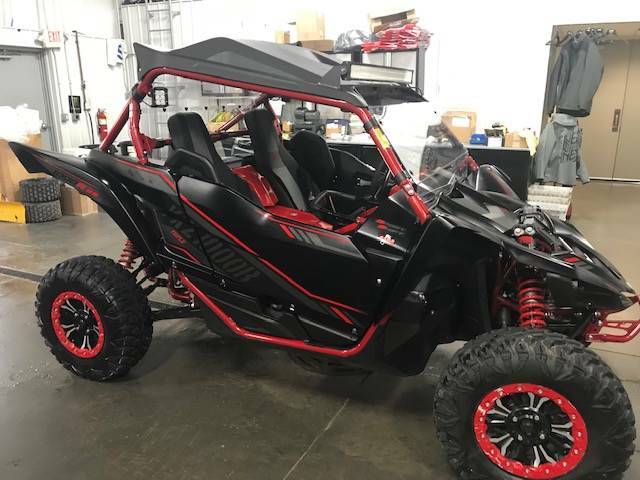 In addition to the performance and durability that comes with Yamaha’s exacting standards, the YXZ1000R SS SE also includes extensive occupant protection without sacrificing driver visibility, and a full-frame composite underbody skidplate protects the chassis from rocks and debris. POWERFUL ALL-WHEEL DISC BRAKES: The YXZ1000R SS SE offers precise braking control thanks to twin-piston calipers clamping down on 245 mm rotors at all four wheels, for excellent braking power, feel and fade-resistance under hard use. An automotive-style parking brake lever is mounted in the cabin’s center console. EXCLUSIVE 27-INCH MAXXIS® TIRES WITH BEAD LOCK WHEELS: Developed exclusively for Yamaha, the YXZ1000R SS SE mounts 27-inch Maxxis® Bighorn® 2.0 radial tires that offer extreme performance, with increased ground clearance, optimum traction, durability, comfort and steering precision. These tires are mounted to tough 14-inch alloy wheels with bead lock plates for maximum tire durability, especially in challenging terrain. STUNNING, INDUSTRY-FIRST THREE-CYLINDER ENGINE: Featuring a compact DOHC 12-valve cylinder head, an aggressive 11.3:1 compression ratio and high-tech dry-sump lubrication, the YXZ1000R SS SE engine offers jaw-dropping power, fantastic midrange torque and a thrilling 10,500 rpm redline. With lightweight forged aluminum pistons and an engine counterbalancer, the motor is exceptionally smooth-running, too. Built for the pure sport side-by-side enthusiast, there’s nothing else like it. SPORT SHIFT 5-SPEED SEQUENTIAL SHIFT TRANSMISSION: The YXZ1000R SS SE breaks new ground with Yamaha Sport Shift, a sequential 5-speed manual transmission featuring Yamaha Chip Controlled Shift (YCC-S) technology. 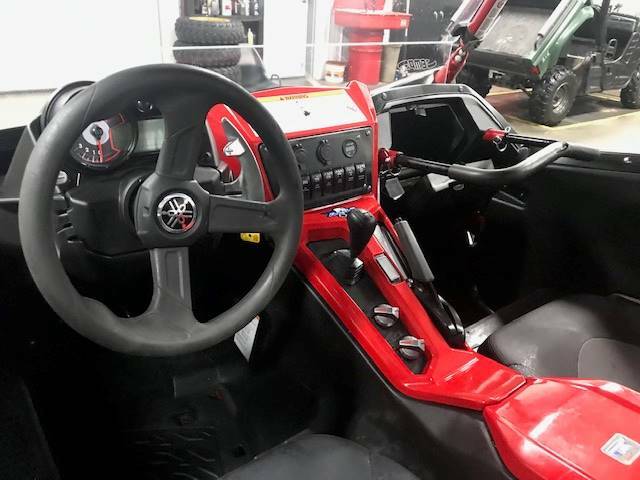 This system combines the power, durability and efficiency of a traditional manual transmission with an advanced automatic clutch system that replaces the foot-operated clutch pedal with sporty paddle shifters mounted to the steering column. Yamaha Sport Shift offers a high-tech riding experience that anyone can enjoy, with rapid and precise gear selection literally at your fingertips. YAMAHA'S EXCLUSIVE ON-COMMAND® 4WD: On-Command 4WD gives the driver ultimate traction, with easily selected 2WD and 4WD full diff lock modes. The YXZ1000R SS SE's drivetrain incorporates Yamaha’s proven On- Command 4WD system to tackle the most challenging terrain. To deliver Yamaha’s exceptional durability, this system also incorporates an over-torque protection system that eliminates spike loads to the front drive case on hard impacts, protecting it from damage without affecting performance. UNMATCHED SIDE-BY-SIDE PERFORMANCE: The YXZ1000R SS SE is proof that Yamaha is the leader in powersports performance. 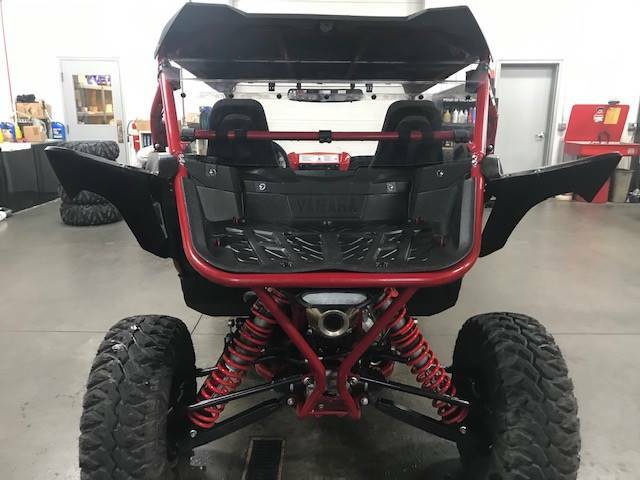 Featuring a 998 cc inline triple engine mated to an all-new Sport Shift 5-speed sequential shift gearbox with On-Command® 4WD, massive industry-first FOX® Racing X2 shocks front and rear, and styling the competition can’t touch, the YXZ® is in a class by itself—the only true pure sport side-by-side ever developed. STUNNING 998 CC THREE-CYLINDER ENGINE: Featuring a compact DOHC 12-valve cylinder head, an aggressive 11.3:1 compression ratio and high-tech dry-sump lubrication, the YXZ1000R SS SE engine offers jaw-dropping power, fantastic midrange torque and a thrilling 10,500 rpm redline. Built for the pure sport side-by-side enthusiast, there’s nothing else like it. TERRAIN CONQUERING, INDUSTRY-EXCLUSIVE FOX® PODIUM X2 SHOCKS: Huge piggyback twin-wall FOX® 2.5 Podium X2 Shocks bring a whole new level of adjustability by giving you high- and low-speed compression damping adjustments, as well as high- and low-speed rebound, all conveniently mounted to the top of the shock body. All shocks also feature dual springs with crossover adjustment—providing 16.2 inches front and 17.0 inches rear travel.